If you’ve spent any time in the Beit Midrash (and what Pardes student hasn’t? ), you’ve at least seen the tall, lanky man seated in the corner, earbuds in his ears, study volume open. And chances are good that he’s approached your table and asked, “Is everything good? Any questions?” If, like me, you’re just beginning to test the deep waters of Torah, Tanakh, Rambam, Ramban, Rashi et al, Hayim Leiter’s presence is as good as a life preserver on a boat. He’s always there, always available to help or just to provide reassurance that you’re staying on course. And if he doesn’t have the answer to your question, he’ll be back with it before you know it. He’s Pardes’ own Shoel Umeishiv—our question and answer man. I can vouch for the efficacy of his approach personally. Ever since I arrived at Pardes in September, barely able to sound out a Hebrew word, much less understand text, and without even a casual acquaintance with many of our classical texts, Hayim has been there, always ready to offer suggestions, to sit down and guide me through troublesome passages, explain concepts and difficult words. He seems to watch out for those of us who are still stumbling, and especially figures out how each student can best be helped. Whether obstacles are intellectual or physical, he finds a way to ease us along the path of learning. Okay, that’s the scholar. What about the surfer? His love of waves began at a hang gliding camp in North Carolina, right on the beach. Already a good swimmer and an accomplished board athlete—skate boarding, snow boarding and even scuba diving (no board needed for that one), “I saw these guys surfing. I thought they were floating on air! It was so cool.” Later that summer, at Cape May, his parents told him there were surfboards for rent. “I went out, got up on my first wave, and that was it. I did not set foot on the beach until they forced me!” Later, he surfed up and down the east coast and taught surfing on the west coast. He visits Tel Aviv and Caesaria beaches whenever there are waves (except on Shabbat of course), and goes as often as once or twice a week. Except when there are “dry spells”—no wind, not any water! Originally from Philadelphia, Hayim studied at the University of Rhode Island (near the beaches and not more than 5 hours from home), learned at the Jewish Theological Seminary and Yeshivat Chovei Torah before receiving smicha from Yeshivat HaMivtar in Efrat. 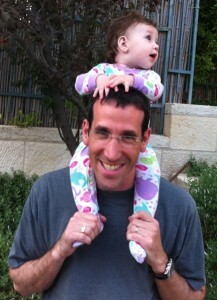 He made aliyah two years ago, his wife Lea came 9 years ago. They have a 16-month-old daughter, Maytal Batya, and are expecting another child in April. If the baby is a boy, one student asked in a multi-part class on brit milah, will Leiter do the brit? His answer was a resounding Of Course!! !